This month's card challenge on the 'Crafts under the Willow' forum was to make a card for a celebration using vellum or acetate, bling, a monogram and a hidden message. I decided to make a card for my niece, Eleanor's birthday, she's 11, a very girly girl, but very sophisticated for her age. I'm really quite pleased with this one (if I do say so myself, lol. I blinged up the monogram with some glitter and the background is my attempt at parchment craft. 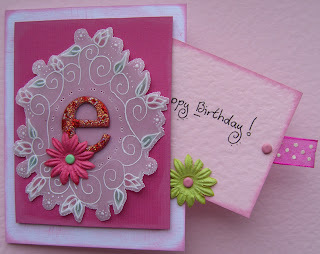 Ooh and the flowers and inks are one of my purchases from a lovely little stamping and card making shop in Holland.